When we finally get to sit down to Easter "dinner" at our house, it will be after months planning and intense musical rehearsals, which will have culminated in a 1 1/2 hour long celebration service at our church. We will be exhilarated and exhausted at the same time, so as much as I want our lunch to be special, it also needs to be simple. I really wanted to do something "fancy," but I kept leaning toward simple, and that's what I went with. 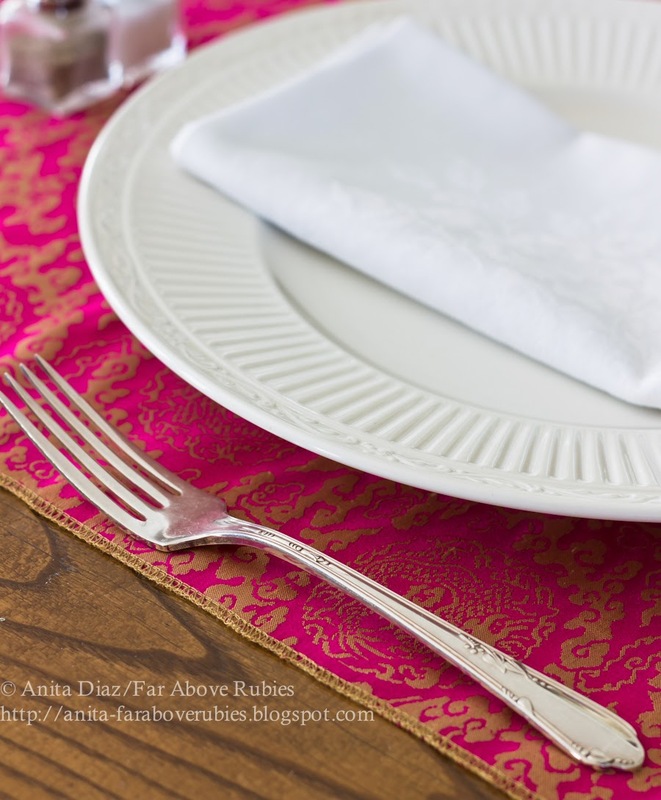 I chose cream Mikasa "Italian Countryside" dinner plates to go with the pink runner I made from antique Chinese silk. I found a pink hydrangea plant for $12 at Walmart and scooped it up with plans to plant what's left when it warms up a bit. 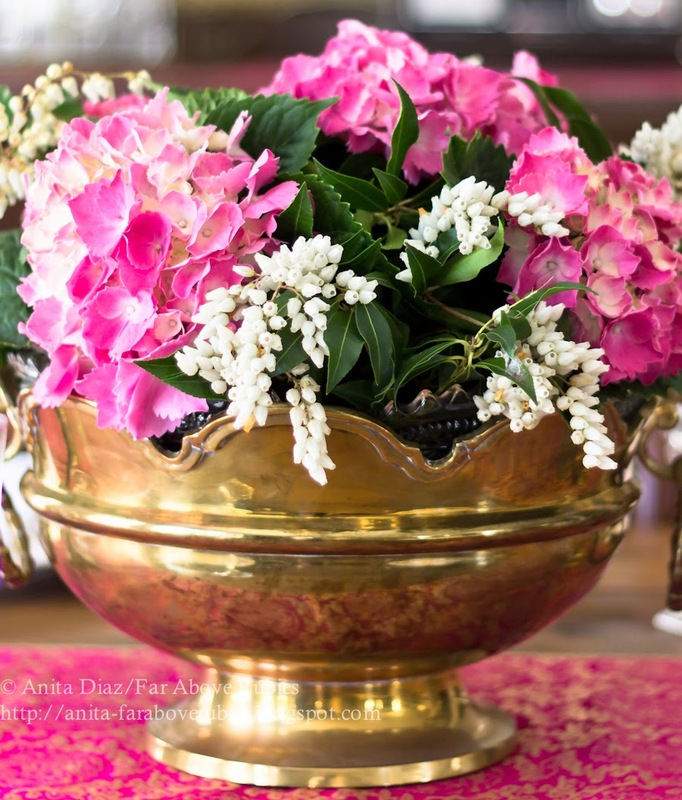 I simply cut the blooms and stuck them in wet floral foam in this vintage brass and crystal punch bowl. Damask napkins were passed down through the family and quietly complete the all-white place settings. 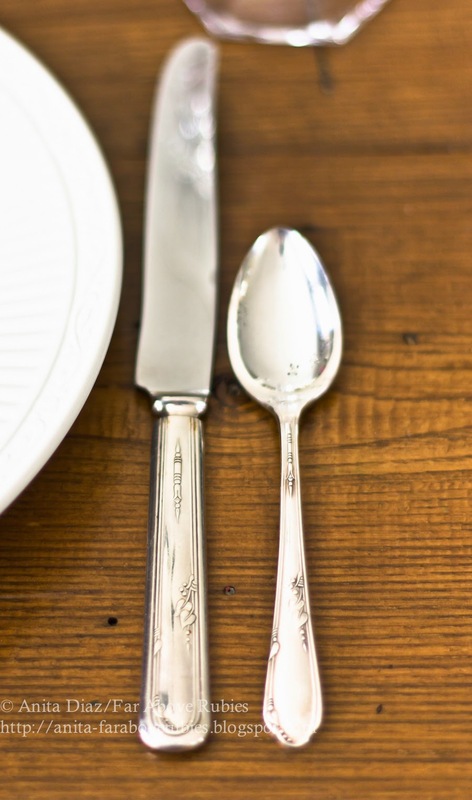 Vintage silver-plated flatware, Oneida "Meadowbrook," is a quiet and elegant reminder of my grandmother. The Fostoria "Heritage" water glasses were a Christmas gift from my mother this past year. 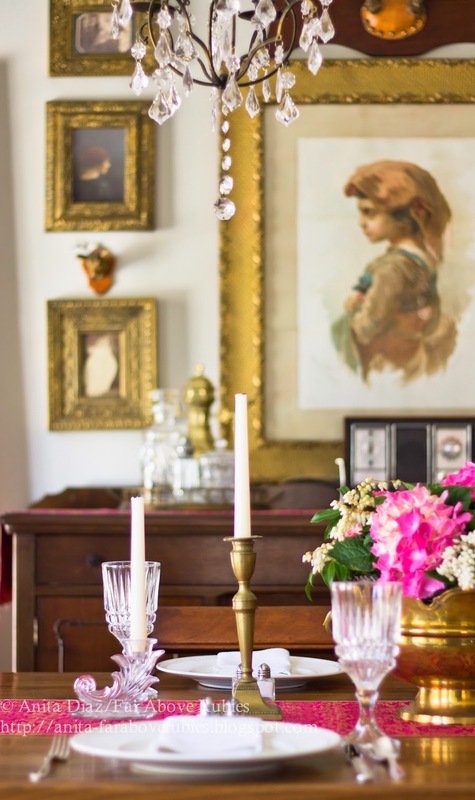 Brass candle sticks I remember from my grandmother's table. ...because, ultimately, Easter is not about a fancy table -- or bunnies or colored eggs. It's about hope -- and the victory of life over death. And for that, I could not be more thankful. Love your table top. 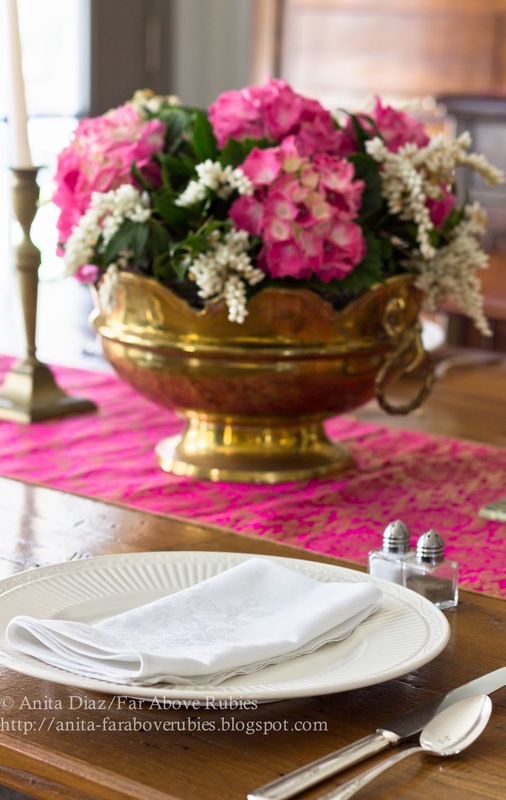 The damask napkins and pink flowers, runner are my favorite. 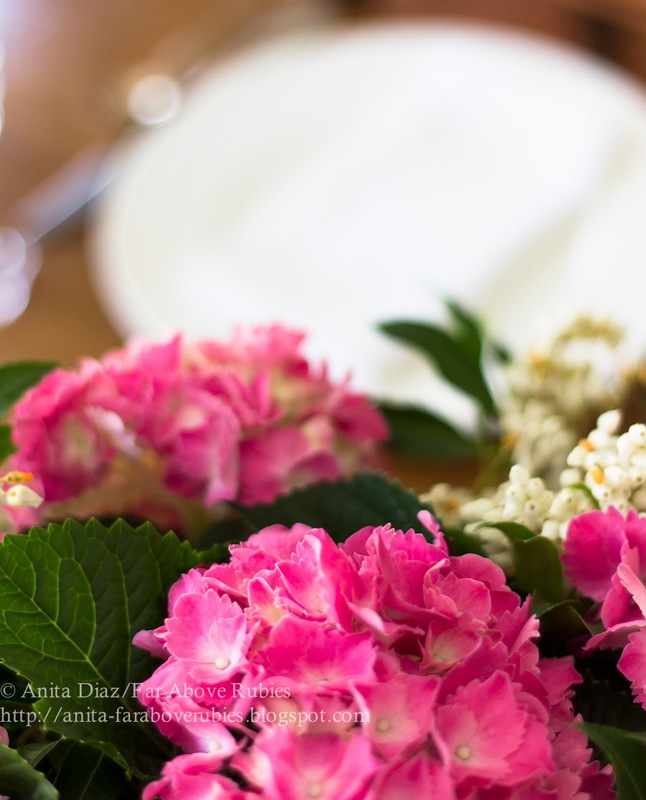 Thank you Anita for sharing your timeless, elegant and wonderful blog with us all. May The Risen Lord bless you and your beautiful family. You are such an inspiration to me everyday. Your dining room is gorgeous. 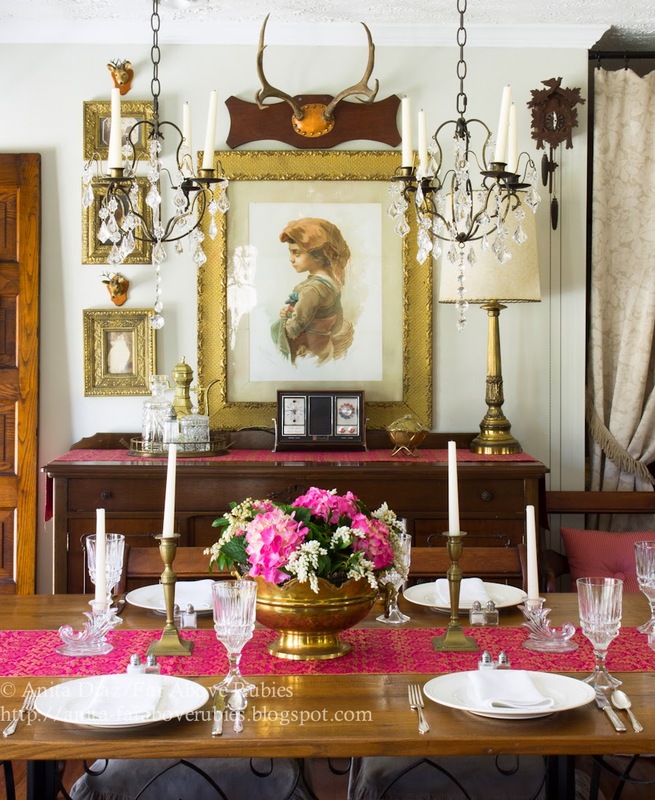 I love that gallery wall and your table setting is stunning. It looks so pretty Anita. 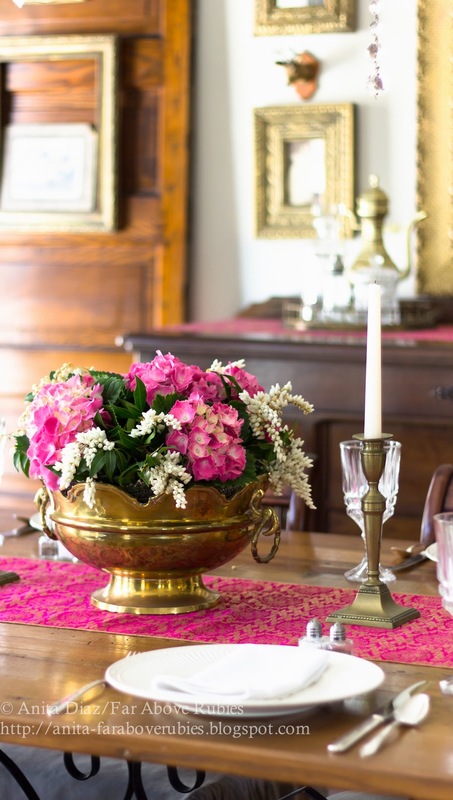 The old punch bowl is perfect for those gorgeous blooms. Your Easter weekend sounds like ours as it's such a busy one with practicing music for the Sunday service. I wish you and your family a very blessed Easter and a lovely dinner. Simply GORGEOUS!! Happy Easter Anita! Your flower arrangement is stunning, and your table is beautiful. Happy Easter! 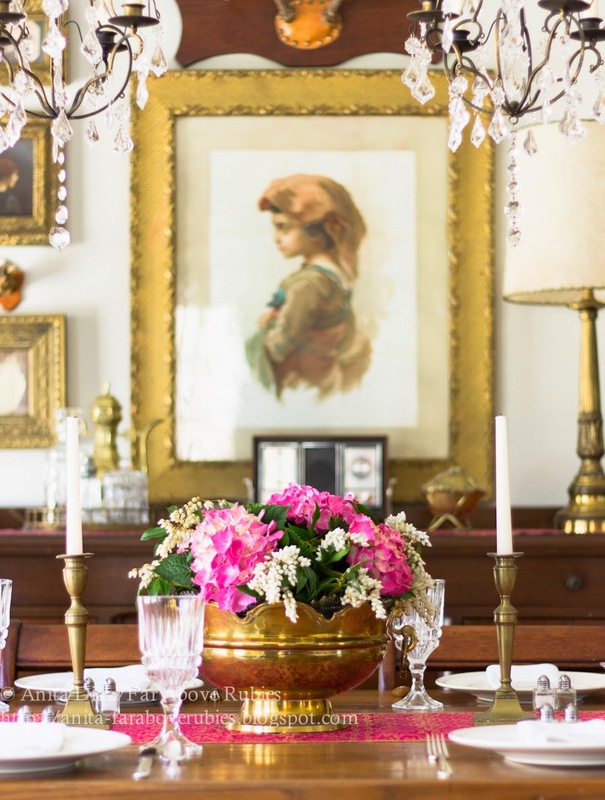 Oh how so very stunning!....Just love the old bowl...and the table setting is exquisite. 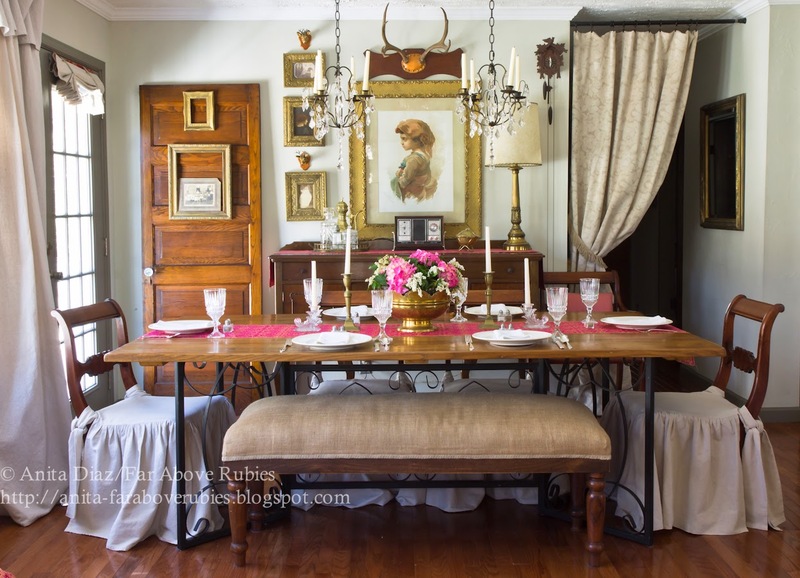 I so love when you post about your amazing dining room....just breathtaking.....Have a wonderful Easter with your family Anita. Anita, I absolutely love your Easter table. From the chair slipcovers to your white Mikasa, to your heirlooms, your table shines with beauty. I so agree about the message: hope. Wishing you a blessed Easter. The pink makes all the difference. Just lovely! And such a beautiful room. Happy Easter! Truly lovely. Have a wonderful blessed Easter. It's all very pretty. Happy Easter to you and your family. Very pretty table. The pink hydrangeas are beautiful. Love the touch of your Grandmother's flatware. Wishing you and your family a blessed Easter. I have hydrangeas on my dining room table right now. I have planted 3 - pale pink, blue, and bright pink after having them in the house and so far they are doing well in the garden. I really love how you use pinks. Lovely table and dining room!